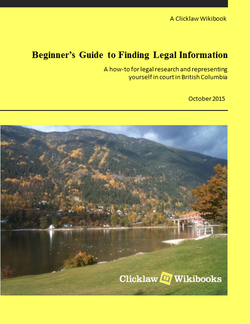 Beginner’s Guide to Finding Legal Information explains how to find legal information in British Columbia. It also provides links to many more self-help resources and guides. This guide is a starting point and is not meant to be exhaustive. It explains the law and legal procedures in general, and is not intended to give legal advice on your particular legal problem. What is legislation? · What is case law? What Is My Legal Topic and What Are My Rights? Which Area of Law Does My Problem Fall Under? How Do I Find Out About Court Procedures? Where Can I Find Help with My Legal Problem? This page was last edited on 23 October 2015, at 08:54.